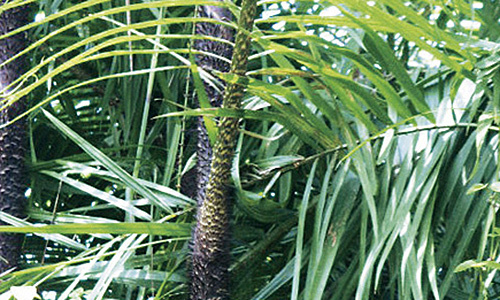 Rattan is a plant that hangs from palm trees native to the tropics and subtropics. Its places of origin include Indonesia, Malaysia, and Vietnam in South Asia. This is a 100% imported material that cannot be harvested in Japan. 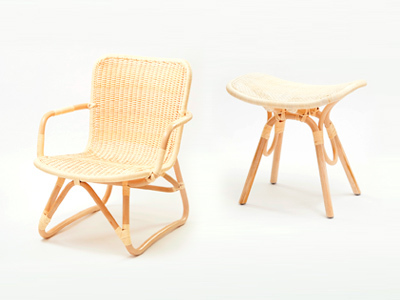 Many people take one look and think that rattan is bamboo, but its properties are completely different. 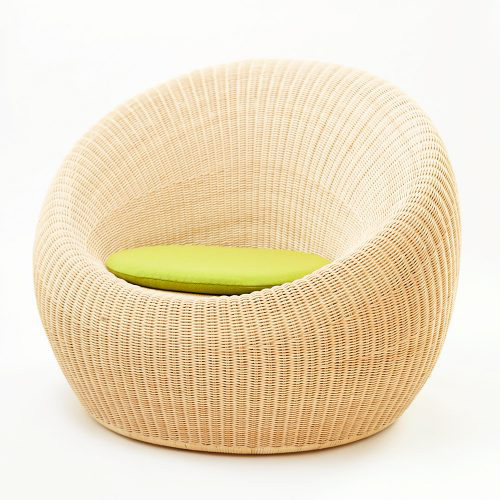 Bamboo is hollow, but rattan is a collection of fiber layers. Its characteristics are that it is strong, supple and light. The pulpwood has long thorns on its skin. Using those thorns, the rattan grows high and coils around other tall plants in pursuit of sunlight. There are more than 300 types of rattan, with a wide range of thicknesses from approximately 2 mm to 6 cm or more. Some rattan even reaches 200 meters in length. It is also known as “the longest plant on the earth”. The strengths of rattan furniture are that it is light and strong, that “flavor” is produced as the furniture is used close to the body, and that it is easy to repair. The backs of carefully produced wicker chairs, etc. bend to a good degree during use and thus come to fit the body of the user. Rattan, with its excellent softness, flexibility, and workability, can also be freely designed with complex, delicate curves. Its supple and smooth form gives an elegant, gentle impression that cannot be produced with machines. Also, rattan furniture produced diligently one piece at a time by artisans incorporates the gentleness and feelings of the maker. The fact that many people use these pieces for a long time with a sense of attachment is surely because the artisans’ attitude towards craftsmanship is conveyed through their products. 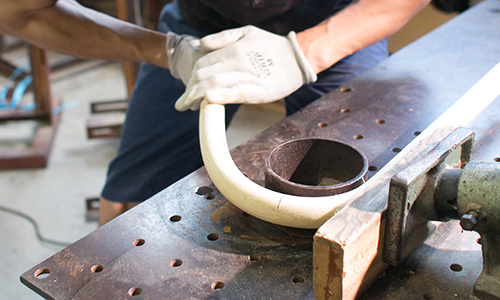 YMK Nagaoka’s products are all hand-made by skilled artisans. The C-3160 Armless Chair continues to be produced with the same manufacturing method as it has been since it was first produced in the 1960s. From wood preparation to completion takes 3-4 days. Rattan material only of good quality is imported mainly from the Philippines. 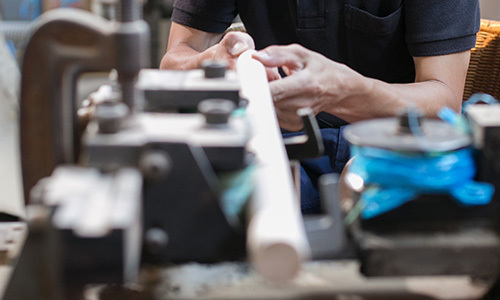 The right materials are selected from a wealth of materials of differing thickness, hardness, curvature, and color, etc., and are cut according to the used parts. 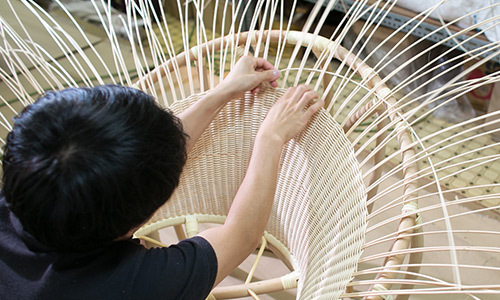 Rattan is a natural material, so bend, curvature and twist naturally exist. Using levers and poles, etc., we correct these materials to make them straight. Boiler steam is sometimes used to steam materials and make them easy to form. 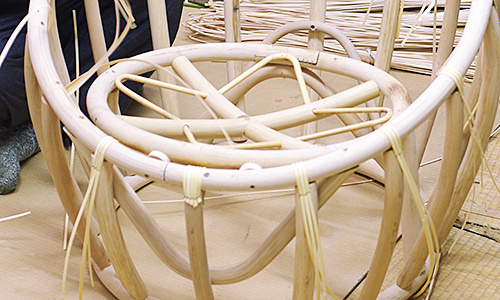 Rattan is bent while toasting with fire or steaming, and each part is thus produced. 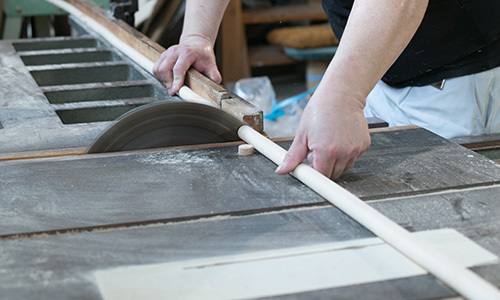 The surface is prepared by applying a plane or sandpaper to burn marks and scratches. The form is fixed using a 3D mold (jig), etc. produced for each part in advance. Each part is assembled with nails or wooden screws, etc. and prepared as an entire framework. There is a sense stability because ratan with a thick diameter that is difficult to obtain. Rattan peel is wound to reinforce joints and to cover nails/wood screws. 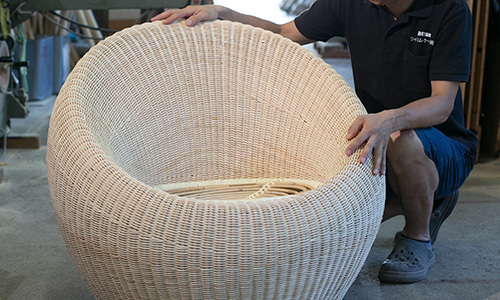 The round core (the core of rounded rattan) is wound around the framework in a horizontal direction, and round rattan is attached to the seat part. 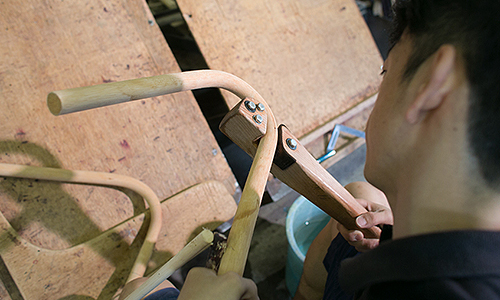 From the central back part, braiding is carried out carefully by hand in line with the framework. Using dampened, softened rattan, subtle curves and textures are produced while assuming a dry state. Braiding brings about a peafowl pattern. After braiding, splinters and fine fibers are burnt off with a burner. After coating and final check, spray-coating is applied as finishing to complete the production. The C-3160 Armless Chair (commonly known as the lounge chair), which was designed for the lounge of Hotel New Japan in 1960, was added to the New York MoMA Permanent Collection in 1964 as a design representative of the 20th Century. This was a first for Japanese furniture. The designer behind this world-renowned Japanese masterpiece the Japan-wide and internationally acclaimed interior designer Isamu Kenmochi. 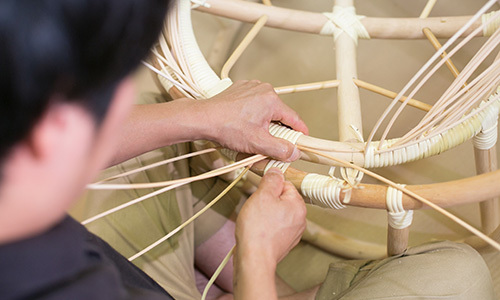 Production was entrusted to our predecessor company, Yamakawa Rattan, with high praise for technological strength, support and understanding of design. Today too, only our company, with its technical expertise and artisanal character, is approved to produce this piece. It can be said that this piece is a YMK Nagaoka classic.